Neue Online-Fachzeitschrift: Das "Scandinavian Journal of Comic Art"
Seit kurzer Zeit ist mit dem Scandinavian Journal of Comic Art ein weiteres akademisches Fachmagazin auf dem Markt, dass sich dezidiert der Comicforschung verschrieben hat. The scope of the journal is interdisciplinary, encouraging a wide range of theoretical and methodological perspectives. The language of the journal is English. 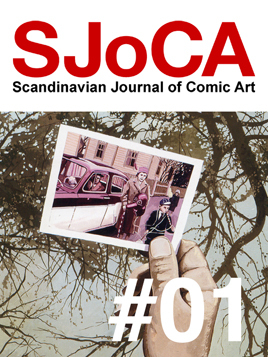 Although global in its scope, publishing high quality research regardless of national or regional boundaries, the journal is rooted in the Nordic countries (Denmark, Finland, Iceland, Norway and Sweden) and has the ambition to reflect and incite discussion in the field of comics studies in these countries. Zur Homepage des Magazins gelangen Sie hier. Zum Inhaltsverzeichnis der ersten Ausgabe geht’s hier.